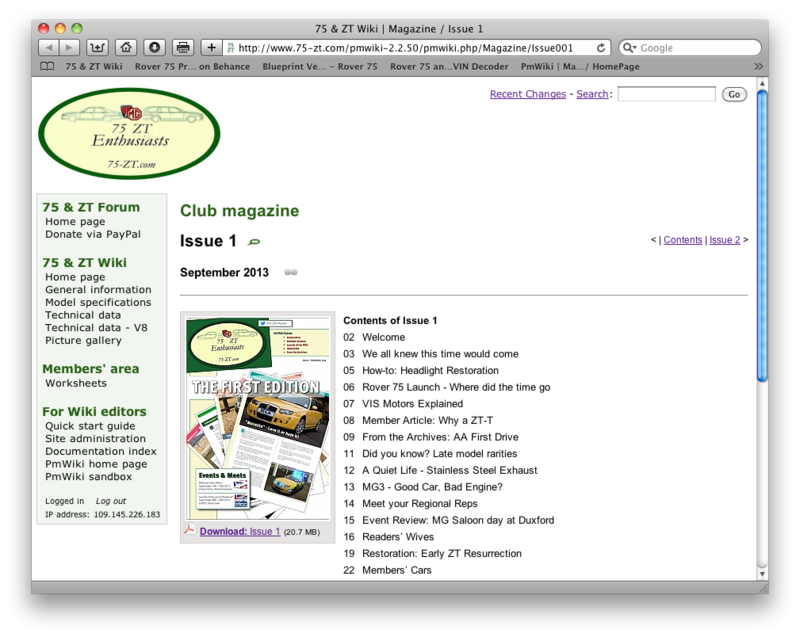 This project is now in its 5th year and has been developed specifically for Rover 75 and MG ZT enthusiasts to use and enjoy. To access the Wiki, you must be registered to the Forum and a subscribed member (click here to access the Forum if registered, or here to register if not). Once on the forum index page, you will find the Wiki by hovering your mouse over the Members Area button at the top of the page. The next three sections of the Wiki contain quite a lot of detailed information about the Rover 75 and MG ZT, which we hope you will find useful and interesting. Please bear in mind, however, that the information shown in the Wiki may not necessarily be correct – so, as with the forum, any use that you make of the information provided is at your own risk. Quite a few people have contributed to this project and their help and input is gratefully acknowledged. The Wiki software has recently been upgraded to allow pictures, illustrations and videos to be included more easily, so these are gradually being added over a period of time, and there are also plans to add more sections to the Wiki in the near future, including an Archives area and some ‘how-to’ guides. Don’t forget, however, that there is also the opportunity to send in articles for publication in the Magazine, or to post up contributions in the forum in the usual way – the choice is yours. We hope that Rover 75 and ZT enthusiasts will find this a useful addition to the support that is available for keeping these fine cars on the road.